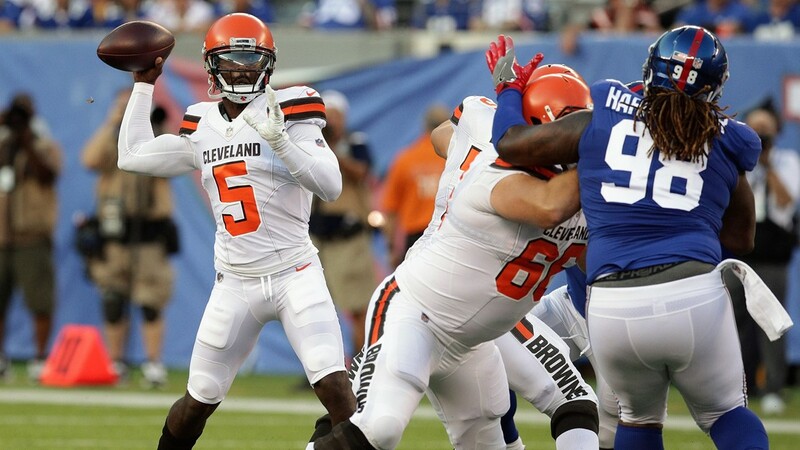 Cleveland Browns quarterbacks Tyrod Taylor and Baker Mayfield had solid showings in a 20-10 win over the New York Giants at MetLife Stadium Thursday night. CLEVELAND -- Cleveland Browns coach Hue Jackson feels quarterback play is and will continue to be the biggest difference between the 2018 team and the 2017 squad that finished the regular season with only the second 0-16 record in NFL history. And during the 20-10 win over the New York Giants at MetLife Stadium in East Rutherford, New Jersey Thursday night, there were plenty of moments that supported the statement, as both quarterbacks led successful drives into the end zone. Cleveland Browns quarterback Tyrod Taylor (5) throws the ball as offensive guard Spencer Drango (66) blocks New York Giants defensive tackle Damon Harrison (98) during the first half at MetLife Stadium in East Rutherford, New Jersey. 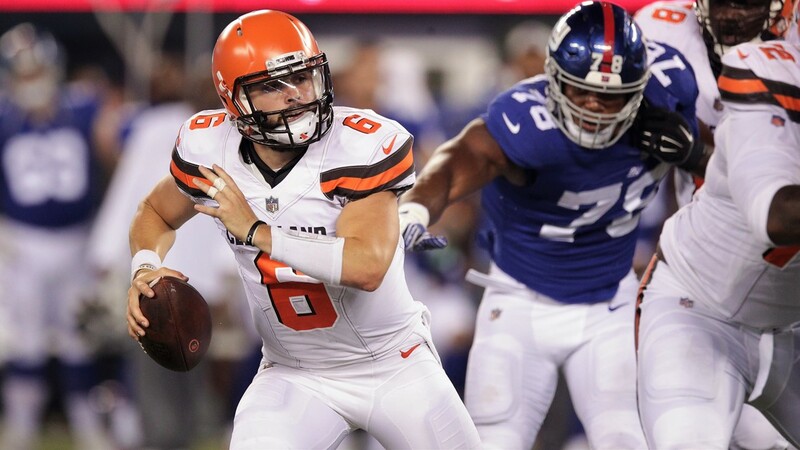 Cleveland Browns quarterback Baker Mayfield (6) scrambles as New York Giants linebacker Jordan Williams (79) pursues during the second half at MetLife Stadium in East Rutherford, New Jersey. 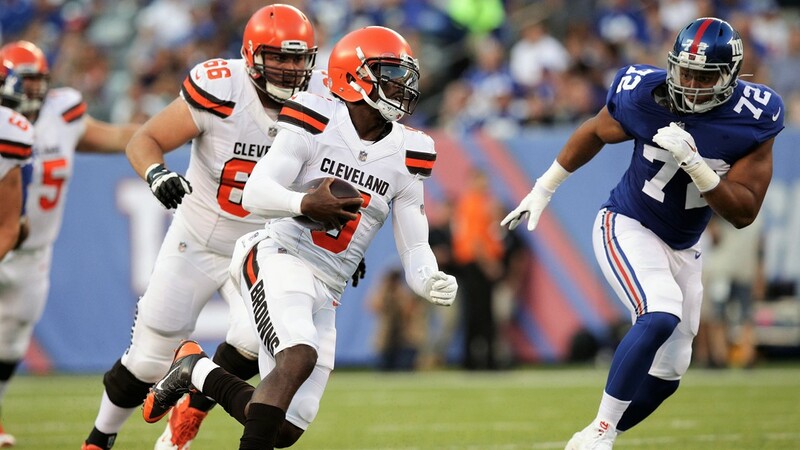 Cleveland Browns quarterback Tyrod Taylor (5) rushes with the ball as New York Giants defensive end Kerry Wynn (72) pursues during the first half at MetLife Stadium in East Rutherford, New Jersey. 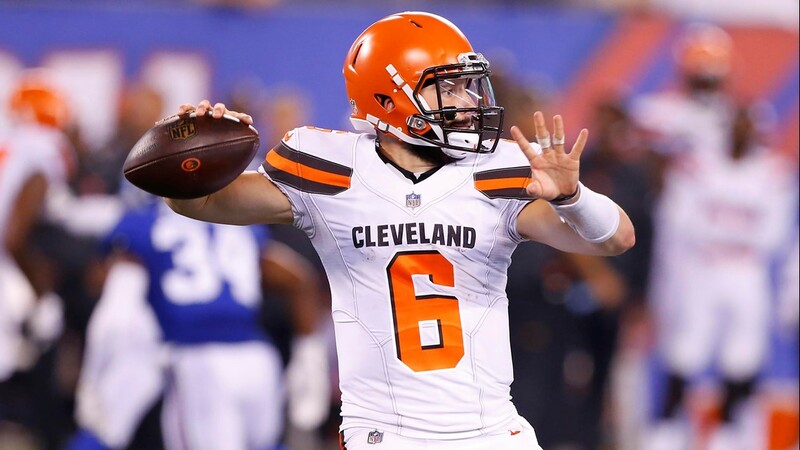 Cleveland Browns quarterback Baker Mayfield (6) attempts to pass against the New York Giants during second half at MetLife Stadium in East Rutherford, New Jersey. 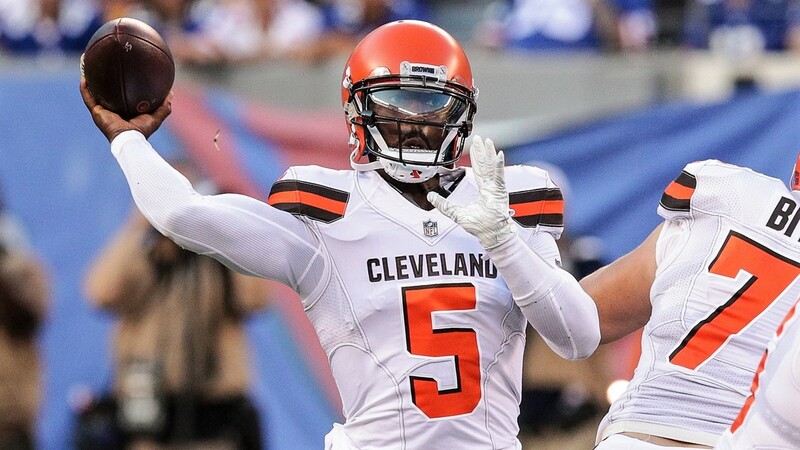 Cleveland Browns quarterback Tyrod Taylor (5) throws the ball during the first half against the New York Giants at MetLife Stadium in East Rutherford, New Jersey. Cleveland Browns quarterback Baker Mayfield (6) throws the ball during the first half against the New York Giants at MetLife Stadium in East Rutherford, New Jersey. Acquired in an offseason trade with the Buffalo Bills and immediately being named the starting quarterback, veteran Tyrod Taylor completed all five of his passes for 99 yards and one touchdown during his two series against the Giants. Taylor spent extra time after a recent training-camp practice working on route-running and pass catching with second-year tight end David Njoku, and that work paid off in the form of a first-quarter touchdown against the Giants. Njoku caught a 16-yard throw from Taylor at the 20-yard line, and then, outhustled Giants defenders down the field before diving across the goal line for the score, which gave the Browns a 7-3 lead with 2:55 to play in the first quarter. In his NFL preseason debut, second-string signal-caller Baker Mayfield found the mark with 11 of his 20 attempts for 212 yards and two scores. With the Browns facing a second-and-goal from the Giants’ 10-yard line, Mayfield fired a pass to the back of the end zone, where despite heavy coverage from New York’s secondary, Njoku pulled in the pass for the touchdown. 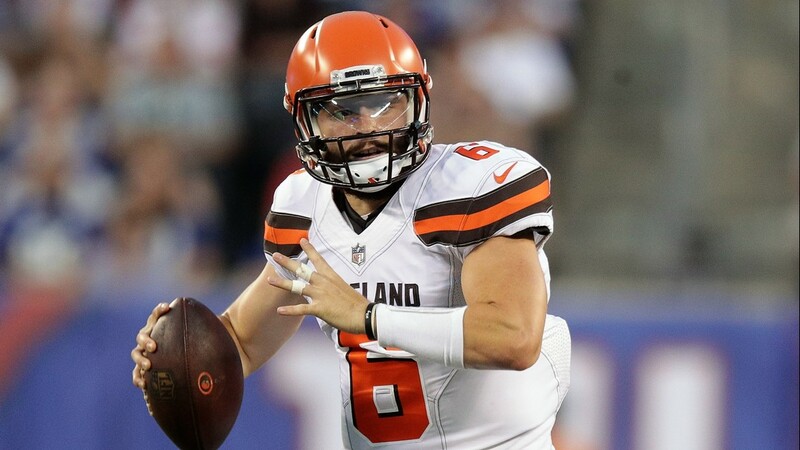 Before throwing the touchdown, Mayfield twice earned the Browns a new set of downs with his mobility, as he rushed for a six-yard gain on third-and-six from the New York 27-yard line, and then, scampered for five yards on fourth-and-two from the Giants’ 13. Then, early in the fourth quarter, wide receiver Antonio Callaway caught a pass from Mayfield after running a slant route from the right side of the formation to the middle of the field and hustled past the Giants’ secondary on the way to a 54-yard touchdown. Callaway’s scoring play gave the Browns a 20-10 lead over the Giants with 13:37 to play in regulation. “I thought he did some good things, but I’m not surprised by anything Baker does because I see him do it on the practice field,” Jackson said.